For a limited time, you can sign up for a free trial of Graze Box here. Graze is a company that delivers healthy snack options in a box directly to your home or office. You can customize each box. Ever better, these boxes only cost $6.99 each. You can request to have each box calorie counted and labeled with the calories if you are watching your weight. 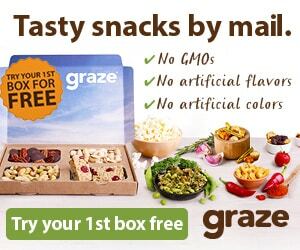 When you sign up today, you will receive your first Graze box for free. You’ll want to hurry if you’re interested in the freebie. The offer is only open for a limited period of time into 2015. The manufacturer limits the offer to the first 250 signups each day. If you don’t get in today, simply try again first thing tomorrow.